I have tons of fishing books, fishing magazines, and fish recipe books. 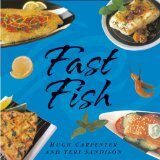 But, the most recent book that I've acquired is the Fast Fish fish recipe cookbook, which was put together by Hugh Carpenter and Teri Sandison. I actually received this Fast Fish fish recipe book as a Christmas gift from my brother and his wife. Of course I wasn't sure what to think about at first. But, once I opened it and started going through it, my mouth just started salivating, lol... I just knew I had to start cooking up some of the recipes inside. I've already tried quite a few of the fish dishes and they were delicious! There is just over 100 pages, yet it's packed with a lot of fish recipes, and a grip of awesome looking pictures. Some of them may seem to require quite a few ingredients, but they are pretty easy to make because of the simple directions they give. And it doesn't really take too long to make - hence the name Fast Fish. And once you sink your teeth into them, you'll realize that it's well worth it. It has recipes for Black Cod (Sablefish), Catfish, Halibut, Salmon, Snapper, Sole, Swordfish, Trout, and Tuna. There's even recipes for tarter sauces, salsas, relishes, and butter sauces. There's even some really cool tips about picking and choosing fresh fish, preparing it, and different methods and techniques for cooking the fish. It also talks a little bit about the different types of kitchen utensils, equipment, and the best ingredients most often used with fish. Fast Fish is a fish recipe book that doesn't hold any disappointment with me at all. I highly recommend this cookbook to anybody who enjoys cooking and eating fish, or even someone who might be a little afraid of fish. Get your copy of Fast Fish today. Thanks Jason, and the rest of you guys at this website. I visit your website all of the time and think that it's put together very nicely. Good job! I've even subscribed to your free newsletter and the rss feed for your fishing blog just so I can stay updated. And yes, I will submit some recipes. Appreciate your fish cookbook review. Thanks for sharing your "Fast Fish" recipe book review, Chris. I happen to have this fish cookbook too. I couldn't agree with you more. It's a great book. And if you don't mind, the next time that you decide to put together a fish dish, why not take a few pictures and submit your fish recipes.